Earn $2.09 in VIP credit (209 points)What's This? Match your Fizik saddle with this high quality Microtex bar tape. This new Performance tape is 3mm thick for slightly more padding than the original Microtex design and features a special grippy texture. Fizik still produces a thinner, 2mm version as well (sold separately). The Microtex Tacky microfiber fabric is not only breathable and strong but offers a little extra grip. Adhesive backing on the tape makes it simple to install and ensures the tape stays in place. 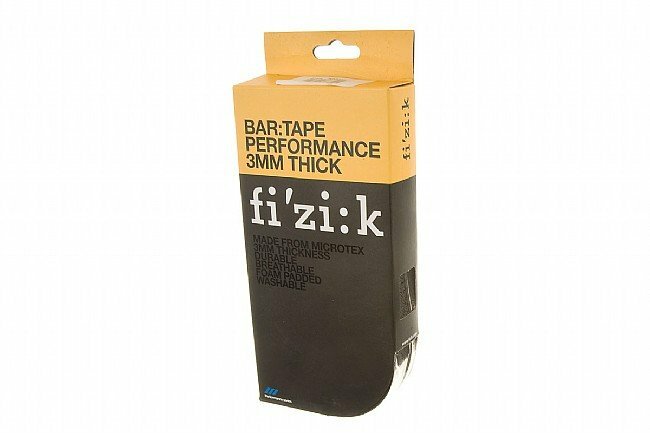 Microtex Performance 3mm Tacky Bar Tape includes 2 rolls of tape, bar end plugs and Fizik logo black finishing tape. Available in Black, White, Blue, Green, Yellow, and Red. This tape was easy to install, looks great and feels even better. I have used a lot of bar tapes and this one seems to be the best all around tape i have found. It does very well in wet conditions, does not degrade easily, and is very easy to wrap. Nice tape, just wish it was a little thinner. Thanks for the review! Try the 2mm version of this tape!